Hola Amigas! I have another happy client. Here are birthday party invites I made for a pool party this summer. Of course the actual invite had all the deets. So what do you think? 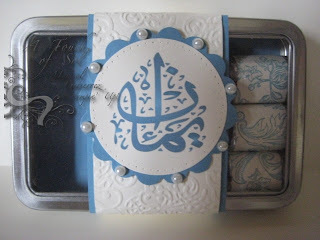 Are you looking for inviations or/and favors? If so email me or call me I would love to work with you! Hola Amigas. Hope everyone had a GREAT weekend. Here in JERSEY it was BEAUTIFUL! and of course that was short lived because today is cold and rainy. This week the LNS Challenge Crew are celebrating and we hope you will too. You can make a card or project that celebrates something important to YOU! With Spring here (even though it's hidden) we have Weddings, Graduations, New Babies and so much more to celebrate. 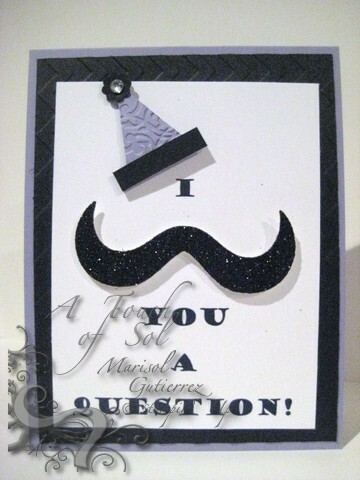 I have chosen to create a birthday card. It seems that whenever I speak to my daughter she is telling me she got invited to yet another birthday party. 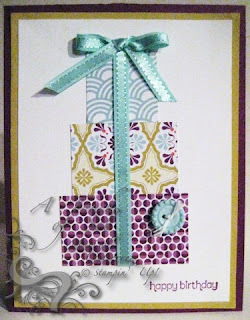 I have yet to try the stacked birthday DSP and it was FUN and super easy. What do you think? I hope you will play along with us this week. I look forward to seeing your artwork. Hola Amigas! 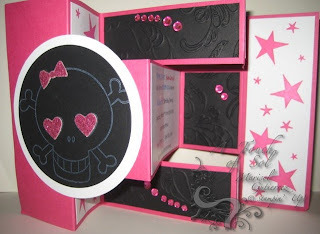 Last month Solimar celebrated her 8th Birthday with a Monster High Bash! 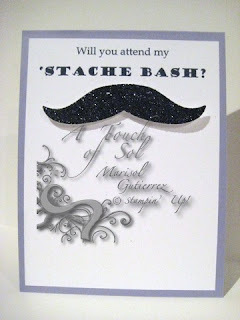 Here is the invite I made for her friends. This is called a Tri Fold Shutter Card. I bought Martha Stewart Journals from Staples for $1.00 and covered them in Whisper White and the Binding in Basic Black. 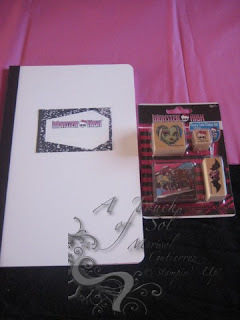 I bought all the girls a Monster High Stamp Set and they had a chance to decorate there journal with the stamp set along with the Just Jawing Stamp Set. The girls also made a Just Jawing Card Set. There was FUN to be had and we had it! Here is Solimar on the right and her cousin Madison and her BFF(since they were 3 I might add) Haley. Here is her BFF Bella. They are showing off their nails. We played Musical Nail Polish. I had the Monster theme song going on and whenever it stopped they had to paint a nail with whatever color they had in front of them...SO FUN! Bella, Olivia and Ashley, 2 more BFFs showing off their Monster Teeth and Olivia (middle) came dressed as Jinafire Long. Ashley has a Glitter Tattoo on her face too courtesy of ME! The GIRLS had a FREAKY FABULOUS TIME and so did I! What a fun challenge we have for you this week. 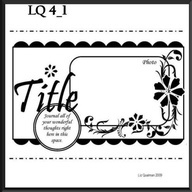 We are going to find a scrapbook layout and use it for a card or vise versa! It is more fun that you would think--give it a try! Come by and view the inspiration for each of the Design Team samples on the LNS Challenge Blog. I hope you can come by and play with this fun challenge this week. Hola Amigas. It's slowly getting warmer and then Mother Nature takes it back...I love SPRING! 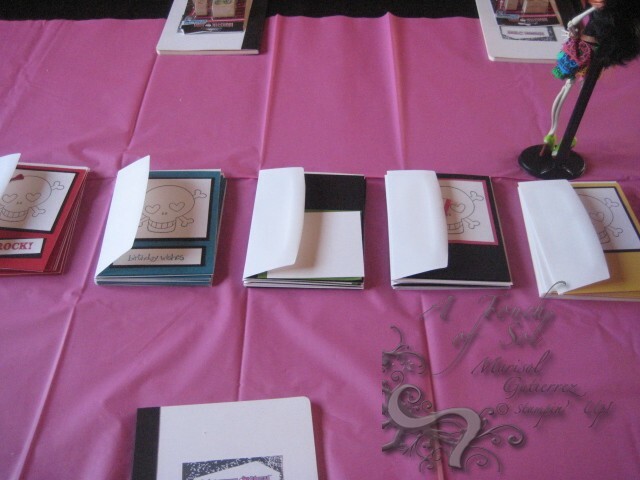 My Mini Crafty Chicas met yesterday for their monthly card class. They are all 8 and I love their excitment. 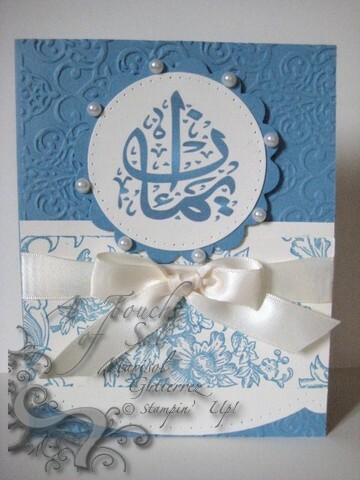 Here is one of the 5 cards they made. I knew I wanted one for this weeks challenge and this is perfect. We used the RETIRED Flight of the Butterfly with the RETIRED Butterfly Punch. 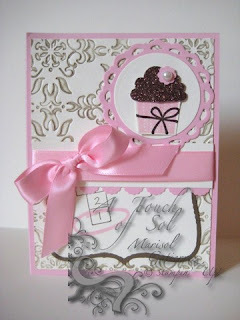 They LOVED the two-step stampin and the matching punch. Here they used a pop up acetate and embossed butterfly in the upper right corner. I hope you will join us in our LNS Challenge this week. 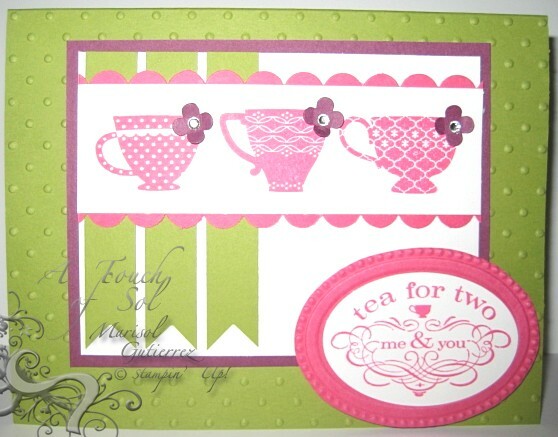 I love how Stampin' UP thinks of everything and coordinates our colors, stamps punches and SO MUCH MORE.